It doesn't matter if you fall down as long as you pick something up from the floor when you get up. You may very well have prepared a nearly perfect gel, and would have a difficult time improving upon the product. If that is so, then by all means gloat about it! If you didn't do such a hot job don't despair. All good scientists learn from their mistakes, in fact, without making mistakes most of us wouldn't learn much at all! 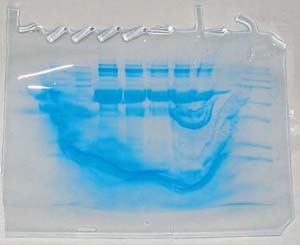 The "Hall of Shame" presents examples of some of the worst gels students (and instructor) have run in past labs, with an example or two from a research lab. They represent many of the ways one can mess up a gel (but not all of them - we're still finding new ways!). See what features of your own gel(s) were unsatisfactory - or at least less than perfect - and use the illustrations to figure out what you might do to improve your technique. To critique your own work identify your symptoms and use the gallery to select appropriate example(s). Each example is linked to a full sized image with suggessted explanations for the symptoms. From this "hall of shame" you should be able to determine what can be done to correct the problem(s). If you wish you may browse by descriptions of symptoms, listed below the gallery.